It’s been a while…so I’m trying something new. The next part of our trip was just as remote as Mrauk U and the Chin region — but significantly more strenuous. We flew to the far East of the country near the border with China, Laos, and Thailand, part of the Golden Triangle. Kengtung is well known for the diversity of people that live in surrounding villages, all accessible by day hike. So we set off on another adventure — captivated and warmed by the people we met. The next day, we went to the morning market to collect supplies for the day. Our guide and his wife convinced us to try a sampling of the local cuisine: we bought bamboo shoots, steamed chicken in a banana leaf, and sticky rice for our lunch. We also purchased some shampoo and crackers to share with the local people when we visited their village. I felt conflicted about bringing gifts of any sort (why is it OK to beg for shampoo, but not money?). While shampoo and crackers seemed like a good choice, I worried about the chemicals in the shampoo polluting their water and the sweet crackers harming the children’s teeth. There never seems to be a simple solution, even when one is trying to do something good. After a while, we were invited into the local “monastery” (read: hut where the one monk lives). It was packed full of people eager to hear the monk speak. He had come to the village only three months earlier, before then the people practiced a purely animist religion. Now, they were learning how to incorporate buddhist beliefs with their own. The monk started shaking uncontrollably and then left the hut to take a walk. It seemed clear to Dan and me that he was very sick, though no one else wanted to admit that. When the monk returned, he talked to the people, and then one of the women started vibrating and giggling. Our guide explained that the “spirit” had “come into her” — this was a very special thing that could happen to only 10 people in the whole village. Shortly thereafter another woman started shaking and smiling; it seemed the “spirit” had also visited her. Dan and I didn’t know quite what to say to this, but our guide’s wife was visibly uncomfortable (she had never seen this before) and asked him if we could go. We thanked the villagers for our tea and set off to enjoy our “picnic” lunch on the hiking trail back down to the valley. This day ended with the strangest hot springs experience I’ve had to date. I’ve been to hot springs in many places, washed myself on a little stool with my mom in Takayama, Japan –and frolicked in the warm water in Honduras in my bathing suit. But I’ve never been someplace with private rooms for one to enjoy the hot springs. Basically, Dan and I took a bath in a “double room” with sulfury water. However, given that our hotel seemed always out of hot water, this was a nice way to relax our sore muscles and get clean at the same time. 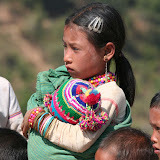 The next day we set out for some different hilltribe villages. After over an hour on the motorbikes, we finally arrived at the Akha village north of Kengtung. The Akha women are especially famous for their beautiful silver headdresses. Each one has an elaborate engraved silver plate on the back, with many silver beads and old Indian silver rupees dangling from the sides. The Akha women are also known for their weaving … and they know it. We were surprised how quickly they set up “shop” when we arrived, hanging purses, belts, and hats for sale over the fence posts. We left the Akha women and hiked for a short while up the mountain to an Eng village. The Eng also are expert weavers and tried to convince us to buy many things from them. Our guide knows the local people well, so we were immediately invited up to sit with the chief of the village and take some tea with him. As we sat and overlooked the valley, at least fifteen Eng women and children crammed into the sitting place to join us. As with the day before, all were really happy to be getting shampoo and crackers! Our last day in Kengtung was spent exploring the town itself. We started by visiting the famous buffalo market, where they sell (you guessed it!) water buffalo. Very strangely, it seems the buffalo trade operates more like a stock market, with speculators hoarding buffalo when they think the prices will rise and trying to sell to the hot Thai and Chinese markets. Unfortunately, buffalo prices came down recently from $1200 to only $800-900 a buffalo, so there wasn’t much action. Dan still picked out the buffalo he wanted though….he keeps telling me that he ordered it and it will be waiting for us in San Francisco. We also visited the big market and saw people from many different tribes buying and selling goods. Among the stranger items for sale were bamboo worms, birds (to free for good merit), gunpowder, and buffalo fat (when you fry it, it puffs up like a cheeto…for those of you who have spent time in Mexico, think Chicharon). Lastly, our guide took us to the most important of the many monasteries in town, Wat Jong Kam. It was breathtaking, with many different images of the buddha seated together in the main hall. The highlight was after our visit though, when we stopped to visit our guide’s mother who lived nearby. In all my travels, I’ve never felt so much like I have really gotten to know the local people as I have here in Burma. We have been literally invited into their homes, met their families, and heard their personal stories (or at least what they feel comfortable talking about openly). It has been wonderful. Once again, this part of our trip was organized by Good News Travels. Highly recommended. We decided to take 2 months off work to take an international adventure. First stop on our trip, Burma (also known as Myanmar). We started by visiting a very remote part of the country, the Rakhine State: the fishing town of Sittwe, a six hour boat ride past tiny villages, the ancient capital of Mrauk U with its hundreds of pagodas. We ventured even further into the isolated Chin State and visited villages where the women still follow the custom of tattooing their faces. After a day in Yangon, Burma’s largest city, we headed out for the remote Rakhine State on the west coast of the country. It was a short flight to Sittwe, but wow the cities are so different. We met our wonderful guide, Than, at the airport — we could tell right away that he was going to be great. (Note that we have changed the names of all the people we met to protect their identities.) We had barely left the airport before he started talking about the government and worsening conditions in the country. I was surprised that he would speak so freely, but this was just a taste of what would come. Over the next four days, we learned a lot about Than’s attitude towards the country, and what he was willing to do to help his people. It was very inspiring. Sittwe is a reasonably large town in the Rakhine State, but very small and poor compared to modern Yangon. On our flight (which only operates 3 times a week), we were two of maybe 10 foreigners. Once we got into town, we didn’t see another causasian all day. The locals clearly don’t see many Westerners either, as they were enthralled with our presence. I’m sure the fact that we were young also added to our mystique. 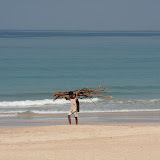 (The few other Westerners we saw in our time in this part of the country were all at least 20 years older than we are.) And then, to top it all off, I’m blond… Needless to say, there were many stares. After a while, I got used to it –but still, I would notice that crowds were assembling and people were following us around, all curious about the young, white couple. Everyone wanted to know if we were a couple or brother and sister, and seemed surprised when Thun told them we were married….so young, they would say. Than took us around the city and showed us the cinema (with rows of bicycles parked outside), the seashore, and the monastery he attended as a chiled. When we visited the monastery, we were surpised that the head monk invited us to sit with him. He was curious about us — where we were from, how old we were… Than acted as a translator in what felt like a magical time. The following morning, we rose early to catch out boat to the old royal city of Mrauk U. We had a small private boat just for us, and, I must say, it was the most magical 6 hours I have ever spent on a boat. Watching the scenery as we floated by, seeing the fishermen and sailors pass as they headed downstream, taking photos of buffalo and small settlements, it was just breathtaking. As we got further upstream, children would rush out to the riverbanks and yell and wave as we went past. Their smiles were so bright. We arrived in Mrauk U mid-day and immediately set off to see the many pagodas. Mrauk U is like a smaller version of Bagan, with considerably fewer tourists. The pagodas were interesting, and the landscape quite beautiful. But I must say that would not have been sufficient to warrant such a long journey. Rather, it was the people we met who made our time there so worthwhile — the novice monks, no more than 6 or 7, who would follow us around the pagodas and smile and giggle when we would catch their eyes, the old men who would stare in an uncomfortable manner, the women who eagerly smiled at me, but wouldn’t make eye contact with Daniel. The next day, we set off on an even more exotic adventure, to the remote Chin villages upriver. The Chin’s are known for their unique custom of tattooing the women’s faces. The story is that it was done to ensure that other minority groups would not steal their women, but that is not certain. The practice is fading away now, as the younger generation do not find it fashionable. The Chin state is heavily controlled by the government of Myanmar, so you can only visit with a permit. I had arranged this part of our trip with a wonderful travel agency in Yangon, so we were all set. 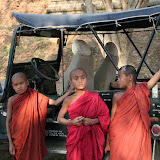 We used a fantastic travel agent to book all our flights and tours in Burma. We highly highly recommend him. William, at Good News Travels, went so far above and beyond in helping us plan our trip — answering all sorts of questions, and even brining me caladryl to the hotel in Yangon for my itchy mosquito bites. He plans the travel arrangements for the US Government Officials — and has been recognized as a “Top Travel Specialist” by Conde Naste Traveler. Shockingly, he’s incredibly affordable and is happy to book an all inclusive tour or a la carte flights and hotels. If you’re planning a trip to Burma, you should absolutely use William. Our trip to Sittwe, Mrauk U, and the Chin villages was organized by him.